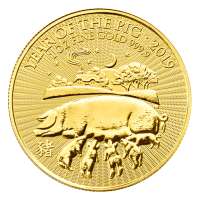 Purchase your 1 oz 2019 British Royal Mint Lunar Year of the Pig gold coin from our online store today for the best price on the web! The Royal Mint's Shēngxiào Collection, of which this coin forms a part, saw inception in 2014 and features the 12 animals of the Chinese Zodiac. The coin's reverse includes images in keeping with the believed personality traits of persons born in the year of the pig: a warm farmhouse under a starry night sky, symbolises calm and belonging, while the hefty pig with her feeding piglets symbolises, family, loyalty and generosity. The scene is set on elaborate, micro-engraved field of textured design and accompanied by the 'Year of the Pig' title, the year of issue and details of weight, metal content and purity. 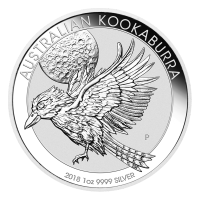 The rendering on the obverse is Jody Clark's detailed effigy of Elizabeth II in profile, this time on a field of micro-engraved, dot texturing. Also on the obverse, you'll find the coin's denominational value and Elizabeth IIs formal title. We celebrate the year of the final Shēngxiào in the Chinese Zodiacal cycle in 2019, namely...the pig, after which the cycle starts over in 2020 with the rat. Pay homage to the ancient culture and symbolism of China and enrich your holdings with a 1 oz 2019 British Royal Mint Lunar Year of the Pig gold coin today. Obverse Jody Clark effigy of Queen Elizabeth II with a new Guilloche style backround and the words "Elizabeth II D.G. Reg F.D 100 Pounds"
Jody Clark effigy of Queen Elizabeth II with a new Guilloche style backround and the words "Elizabeth II D.G. Reg F.D 100 Pounds"
1 oz 2019 British Royal Mint Lunar Year of the Pig Gold Coin Purchase your 1 oz 2019 British Royal Mint Lunar Year of the Pig gold coin from our online store today for the best price on the web! The Royal Mint's Shēngxiào Collection, of which this coin forms a part, saw inception in 2014 and features the 12 animals of the Chinese Zodiac. The coin's reverse includes images in keeping with the believed personality traits of persons born in the year of the pig: a warm farmhouse under a starry night sky, symbolises calm and belonging, while the hefty pig with her feeding piglets symbolises, family, loyalty and generosity. The scene is set on elaborate, micro-engraved field of textured design and accompanied by the 'Year of the Pig' title, the year of issue and details of weight, metal content and purity. The rendering on the obverse is Jody Clark's detailed effigy of Elizabeth II in profile, this time on a field of micro-engraved, dot texturing. Also on the obverse, you'll find the coin's denominational value and Elizabeth IIs formal title. We celebrate the year of the final Shēngxiào in the Chinese Zodiacal cycle in 2019, namely...the pig, after which the cycle starts over in 2020 with the rat. Pay homage to the ancient culture and symbolism of China and enrich your holdings with a 1 oz 2019 British Royal Mint Lunar Year of the Pig gold coin today.